The BeatlesFact for "Mean Mr. Mustard," a Lennon song, was that it was written by John in 1968 while in India. Lennon had actually read an account of a mean man similar to the Mr. Mustard in his song, a man who actually did hide five-pund notes in his nose. Lennon regarded the song as a "piece of garbage." An early home recording of the song can be heard on Anthology. "Sun King" and Mean Mr. Mustard" were recorded as a single song for the Abbey Road album on July 24, 1969. Lennon and McCartney do the lead and harmony vocals respectively. 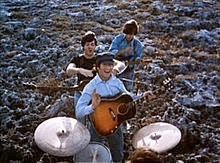 McCartney plays fuzz bass, Lennon piano, Harrison lead, and Starr drums and tambourine.